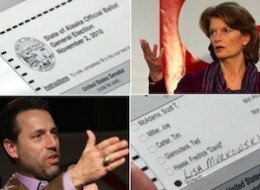 With the counting of the Alaskan write-in ballots underway, tea party-backed candidate Joe Miller has already filed a lawsuit challenging the results - apparently Miller wants to block the votes of Alaskans who either had a difficult time spelling candidate Lisa Murkowski's name or who spelled the name correctly but didn't write it the way Miller wanted it to appear, like using cursive letters or writing "Lisa, Murkowski" or "Lisa Murkowski Republican." While Miller is proving to be a sore loser before the results have even been announced, I thought his lawsuit was very interesting and an Anchorage Daily News article by Richard Mauer explains why. The state says that Republican U.S. Senate candidate Joe Miller has no business going into federal court now to challenge the counting of write-in ballots for his opponent and urged a federal judge to dismiss the case he filed this week. State courts are the proper forum to interpret Alaska election law and the actions of state officials, Assistant Attorney General Margaret Paton Walsh said in her motion to dismiss. Until the Alaska Supreme Court has spoken, Miller has no legal basis to make a federal case out of the issue, she said. "The plaintiff (Miller) in this case has attempted to dress his state-law claims in federal-question clothing, in order to go forum shopping," Paton Walsh wrote. "The Alaska Court System is the proper forum for this case. The Alaska Supreme Court is very familiar with the state's election laws -- issuing an election law decision as recently as two weeks ago -- and is the appropriate court to interpret Alaska's election statutes." As a candidate, one of Miller's central messages was that the federal government has overreached into areas that should be run by the states, whether that was Social Security, health care, education or resource protection. Now the state says it is Miller who is overreaching by asking a federal court to interfere in what should be an Alaska affair. Miller has said that election officials supervised by Lt. Gov. Craig Campbell are improperly interpreting a state law that says that write-in votes can count only when the full name or at least the last name is spelled exactly as it appears in the candidate's write-in declaration. This week, his observers in Juneau have even been challenging write-in votes with ambiguous penmanship -- in particular, letters that bump up against each other and raise the question of whether an "ow" combination is actually an "au," for example. On Tuesday, Miller filed suit in U.S. District Court in Anchorage, asking for an immediate injunction barring the state from counting any ballot for Murkowski with a misspelled name. On Wednesday, U.S. District Judge Ralph Beistline rejected Miller's request for an injunction. Because election officials are segregating ballots on which questions had been raised, Miller faces no irreparable harm -- the ballots could always be reviewed later, he said. Isn't it interesting that a candidate who spent so much time attacking the federal government is now asking for their help? The correct route would have been file suit in the state courts and then file an appeal with the federal courts. Mr. Miller also has repeatedly said that unless it is specifically stated in the Constitution, the federal government does not have authority to pass laws involving a subject matter. As a result, unemployment compensation and social security are unconstitutional. Well Joe, where is the specific legal authority in the Constitution for a federal court to hear your case involving a state matter, now or in the future assuming you lose. Oh, and by the way, the Alaska's Chief Federal judge recused himself from the case when it was filed because "he has a poor opinion" of Mr. Miller. Interesting to note that during the primary Joe Miller made a big deal and was all in support of "voter intent" when it came to write-ins, but now that he is no longer the beneficiary he is against this. This was stated in an interview by the Attorney General earlier this week and that when Miller complained during the primary he gave in so he doesn't see why Miller all of a suddent can change his tune.